One of the most unfortunate cancellations of Comic-Con 08 was the Ghostbusters: The Video Game panel, planned to feature actors Dan Aykroyd and Ernie Hudson as well as reps from Sierra. While we were disheartened to learn of the nixing of that particular panel, we took comfort in the limited, but very awesome, showfloor demo of Ghostbusters: The Video Game. Based on our limited playtime, we're more interested than ever to get our hands on the final version, and not just for the stellar performance from the Ghostbusters booth babes. The Comic-Con demo takes place in the New York public library, the location featured at the beginning of the first Ghostbusters film. As the four Ghostbusters enter the library — Winston Zeddemore, Egon Spengler, Ray Stantz and you, the new recruit — the cheers of New Yorkers can be heard in the distance. The 'Busters are tasked with taking out a few unwelcome guests holed up in the library, one being the librarian ghost seen in the first film. 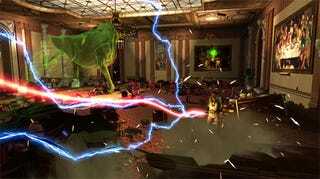 The demo introduces the player to the PKE meter, which senses ectoplasmic activity and scans spirits and ectoplasmic residue a la the visor in Metroid Prime. Used in conjunction with the "paragoggles", you'll be able to hunt down evidence and find traces of ghosts. Hitting the Y button the Xbox 360 controller brought up the PKE meter and switched to first-person paragoggle mode. After tracing one of the specters into the basement, we came across one of the game's mini-boss fights. As we entered a huge room in the library and met up with the other three Ghostbusters, a giant book golem, essentially a swirling mass of books with a reading lamp for a head, attacked. While it wasn't clear what we had to do to defeat the thing after scanning it, Stantz just encourage us to cooperate and saturate the thing with proton pack beams. Your proton pack has a very film accurate feel to it. It feels wildly out of control (in a good way) and has a few alternate modes of fire. You can do a "slam" move with the left trigger to drain a ghost of its energy, essentially firing a burst of extra proton pack power. The backpack can also overheat when used for long stretches, so you'll have to vent it if you don't want an interrupted proton stream. After our book golem fight — which took far, far longer than we thought it would — we headed further into the depths of library, the location of the librarian ghost. Walking through the aisles of the library archives, we were attacked by flying books, moving book shelves and a occasionally, a ghost known as the Collector. We met up with the Collector, who threw dozens of animated books and whatever library furniture was in the room at our character and Ray Stantz. This was our first attempt at using the ghost trap, which the player can toss on the floor with the X button. Positioning the ghost by manipulating it with your proton beam is no easy task, even with an AI controlled Stantz helping us out. At one point, Stantz went down and we had to revive him with the A button, making our final push against the Collector a bit easier. After containing the flying specter with the beam, then slamming it against the walls and ceilings, we finally got the Collector into the containment unit, ending our demo. We were pleasantly surprised at how well the game captured the mood of the first film, no doubt helped by the inclusion of voices of Ernie Hudson, Dan Aykroyd and Harold Ramis. None of Bill Murray's dialogue was featured in the demo level, sadly, but what we did hear of the other actors sounded great. Ghostbusters: The Video Game has attention to detail — and fan service — in spades. The PKE meter model looks spot on and the menu selection screen, the Ghostbusters firehouse HQ, is a nice touch. The game simply looks fantastic, with beautifully modeled characters and props. Our main complaint — a minor complaint — with the game's visuals were the overly glossy, over bloom-lighted graphics. Otherwise, the game looks brilliant. One thing we hope is addressed are the cues that direct a player what to do next and how to use their ghost bustin' tools. We actually restarted the demo because we felt like we'd missed some sort of critical direction from the NPCs. Turns out we just hadn't scanned a display case (one that we didn't even see during a few minutes of poking around). We also suspect that our book golem fight took much longer than necessary because we weren't really familiar with the alternate firing modes of the proton pack. Hopefully, this issue can simply be chalked up to the limited available play time. It may be Ghostbusters nostalgia taking over, but our brief taste of the game did feel like a return to form for the property. The whole experience captured the experience, or what we assume the experience, of being a part of the Ghostbuster team would be like. We're very, very excited to get our hands on the game again.